Near the end of last week we did a science experiment where we dissolved 1/4 cup of salt into 2 cups of water and then waited for the water to evaporate. It took 5 days for all 2 cups of water to evaporate. Every day for those 5 days the boys and I would take a look into our shallow dish to observe and see how far the water had gone down and if we could see the salt. 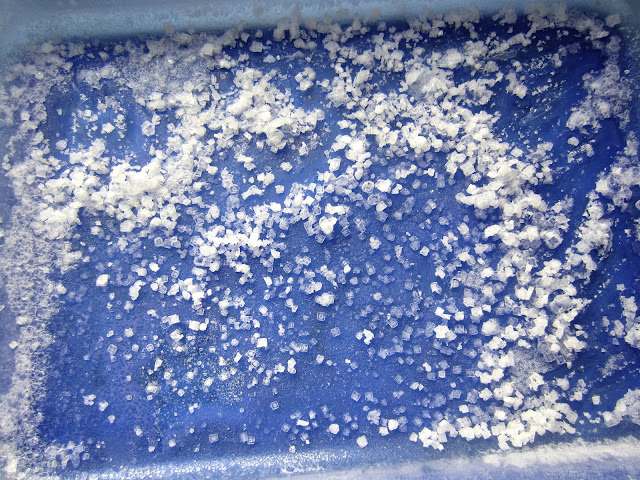 The once fine salt ended up gathering into thick square crystals. The boys enjoyed tasting them. I am so glad I don't have to wait 5 days to evaporate sea water from sea salt in order to bake an apple pie!